Ulster Co., New York, published in the late 1800s. Note from JTR: There are some questions this article raises. of New Haven by his first wife Susan as most researchers believe? Edward Ball, who was born about 1640, came to this country from Wales in the year 1664 and located at Branford, Connecticut, where he married Abigail, daughter of Thomas Blachley. On October 25th of the following year, in company with twenty-five persons, he settled on the site of the present prosperous city of Newark, New Jersey, where he remained, and where some of his descendants are still honored and useful citizens. Others live in different parts of New Jersey and the United States. He was a man of influence and prominence, and occupied positions of trust and responsibility among his fellows. He was high-sheriff of Essex Co., New Jersey, in 1692 and 1693, and filled many minor offices. His last appearance in public life was as a member of the grand jury of Essex County in February, 1709-10. He was living in June, 1724, being then at an advanced age. The children of Edward and Abigail Ball consisted of four sons and two daughters: Caleb, Joseph, Moses, Thomas, Abigail, and Lydia. Caleb and his wife, Sarah, had two sons, Caleb-2 and John, who moved to Hanover, New Jersey before 1740. Joseph died in 1733, and left children. Moses died in 1747 leaving no issue. 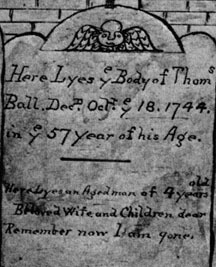 Thomas died in 1747 and left children. Abigail became the wife of Daniel Harrison and died leaving children. Lydia married Joseph Peck and left children. John, son of Caleb-2, left three sons: David, Daniel and Samuel. David left a family. Daniel had five wives and died in 1820, aged eighty-three. Samuel was twice married; his first wife was Miss Miller of Elizabeth, New Jersey and the children of the union were Annie, Elizabeth and Cornelius. His second wife was the widow Plume, whose maiden name was Deborah Farrand, and his children by this marriage were: Aaron, Samuel, Electa, Lydia, Sarah, John, James, Harvey, Amzi and Deborah. Cornelius, son of Samuel by his first wife, was married at Chatham, New Jersey on Sept. 4, 1786 to Sarah Budd. His children were Phebe, born Sept. 20, 1788 and who married David Edwards of Chatham, New Jersey; Jacob G., born Sept. 9, 1790; Burn. Budd, born Dec. 26, 1793, who served in the war of 1812 and afterwards settled in Indiana; William, born Nov. 28, 1795, and who settled in Ohio, about 1814; Samuel, born April 12, 1797, and who located in Mobile, Alabama in 1818; and Mary, born Sept. 15, 1800, and who married Thomas Thompson of Moreau, Saratoga Co., New York. Jacob G. Ball was a potter by trade, and married Lucretia Hoyt at Norwalk, Connecticut on Nov. 30, 1809. The children of this union were Albert, born Sept. 13, 1810, who married Susan Depew of Poughkeepsie, New York, in 1833 and who settled in Texas in 1840; William, born Aug. 21, 1842, and who resides at Northumberland, Saratoga Co., New York; Mary E., born June 10, 1815, who married Abner Brown, and who also resides in Northumberland; George, born May 9, 1817, a successful and prosperous merchant of Galveston, Texas; Charles, born April 4, 1819, who married Rebecca Simpson, of Poughkeepsie, New York, and who went overland to California, in 1849, where he still resides; Sarah, born May 14, 1821, died Oct. 8, 1824; John B., born in Northumberland, Saratoga Co., New York on April 5, 1823 ; James, born Feb. 14, 1825, who married Sarah Scott of Poughkeepsie in 1851, and who died at that place on May 9, 1862, of fever contracted while serving in the Union army in North Carolina; Job, born March 4, 1827, who went to Texas in 1846, and afterwards to New Mexico, where he now resides; Harriet, born Jan. 20, 1829, died August, 1833; Nettie, born Jan. 8, 1831 and who married Robert S. Armstrong of Milton, Aug. 31, 1879. Jacob G. Ball married the widow Hoxie of Poughkeepsie, for a second wife, on Dec. 4, 1836, and had three children by the union, viz. : Samuel, born March 25, 1838, who married Elizabeth Thompson, of Moreau, New York and settled at Scotch Plains, New Jersey; Ellen, born July 14, 1840, and who removed to California in 1863, where she married R.G. Stanwood, of Marysville; and Burn. B., born March 17, 1842, who served in the regular army of the United States during the late Rebellion, and who married Adelaide Mackey of Milton, New York.